<?xml encoding="UTF-8"> Serving Broken Arrow, OK, CW - DC Auto Electric provides starters, alternators and batteries. CW DC Auto Electric and Trolling Motor Shop supplies Broken Arrow and eastern OK with a wide variety for all your DC automotive, commercial, farm, lawn & garden, marine, ATV, and RV needs! We also offer trolling motor repairs, sales, and parts. We are an authorized warranty and repair center for Motorguide and Minnkota trolling motors. We also provide installation for fish locators and depth finders plus much more. 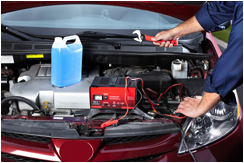 We offer many types and models of starters, alternators, and batteries for your needs. Our company also provides fast and friendly service at a friendly price. When it comes to top-quality DC electric and trolling motor solutions with great value, we're here for you. We also offer guarantees and warranties for our products and services. We guarantee wholesale prices on all starters, alternators, and batteries. Power Up All of Your Automotive, Commercial, Farm, Marine, Lawn & Garden, ATV, and RV equipment. Call Now! Contact us for all of your starter, alternator, battery, and trolling motor needs. Our products are available for pickup and delivery for commercial and farm accounts only.